Salads aren’t just for the warm weather months, but when I get my vegetable cravings in the winter I change up my salads with heartier vegetables and ingredients that have warm, smoky flavors, like roasted vegetables and smoked paprika. 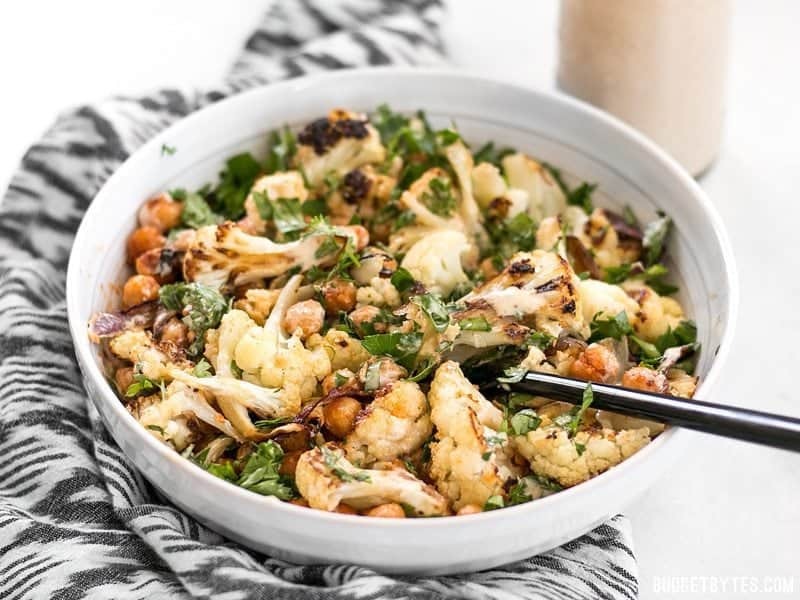 This Roasted Cauliflower Salad is actually a play on one of my other favorite salads, Mediterranean Farro Salad. 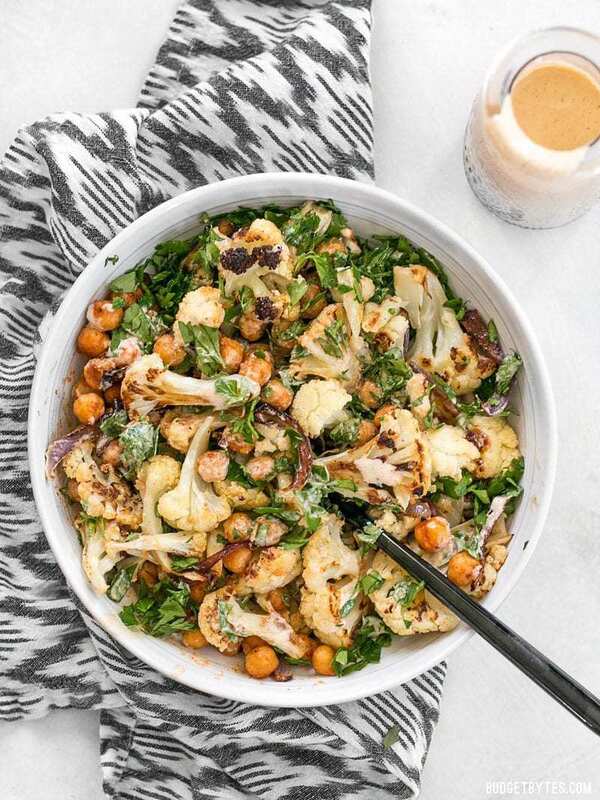 I used the same Lemon Tahini dressing (because it’s so good that I want to pour it on everything) and spiced chickpeas because I thought they would provide just the right punch to compliment the mellow roasted cauliflower. The combination of roasted cauliflower, sweet red onions, spiced chickpeas, and tangy lemon tahini dressing might be my favorite yet! 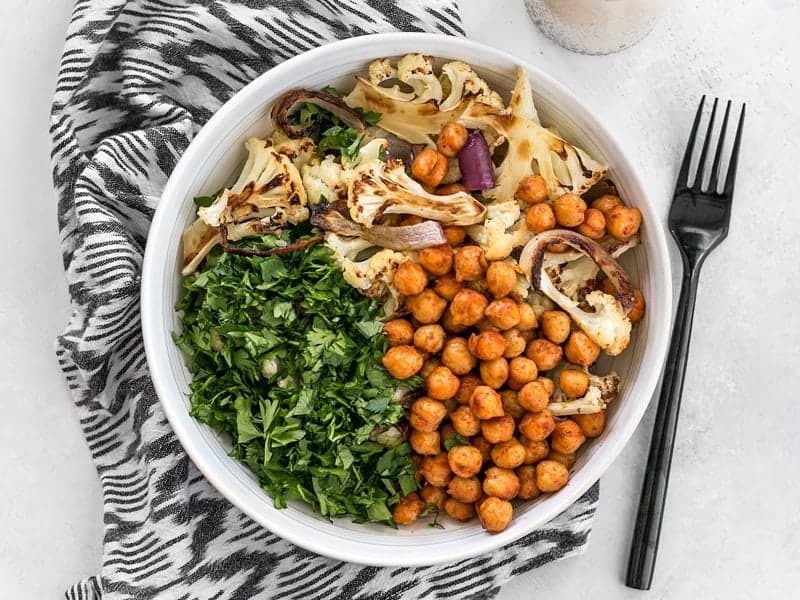 Parsley is a great green to use for salads because it’s cheap and the presence is subtle enough to not over power the cauliflower and chickpeas. Baby spinach would also work, as would finely chopped kale, but both will likely be a bit more expensive. 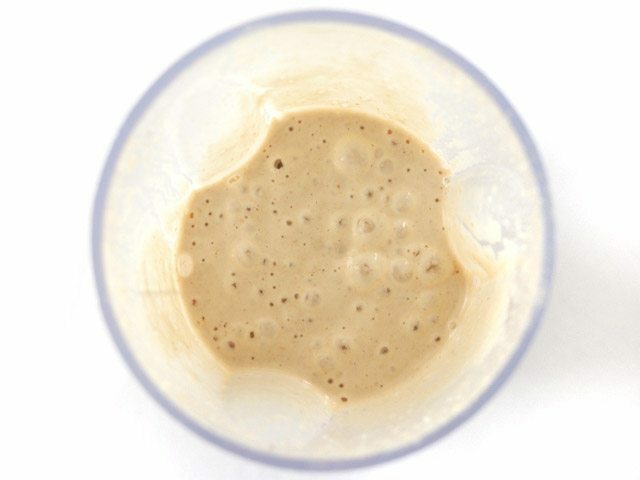 And if you’ve never heard of tahini, it’s just like peanut butter, but made with sesame seeds instead of peanuts. It has a creamy yet slightly sharp flavor that is totally unique. It’s usually about twice the price of peanut butter, but it’s a valuable ingredient and stays good in the fridge for just about forever (just like peanut butter). You can use it to make gobs of delicious homemade hummus, as well as this amazing lemon tahini dressing. I promise you’ll want more of this dressing. Preheat the oven to 400ºF. 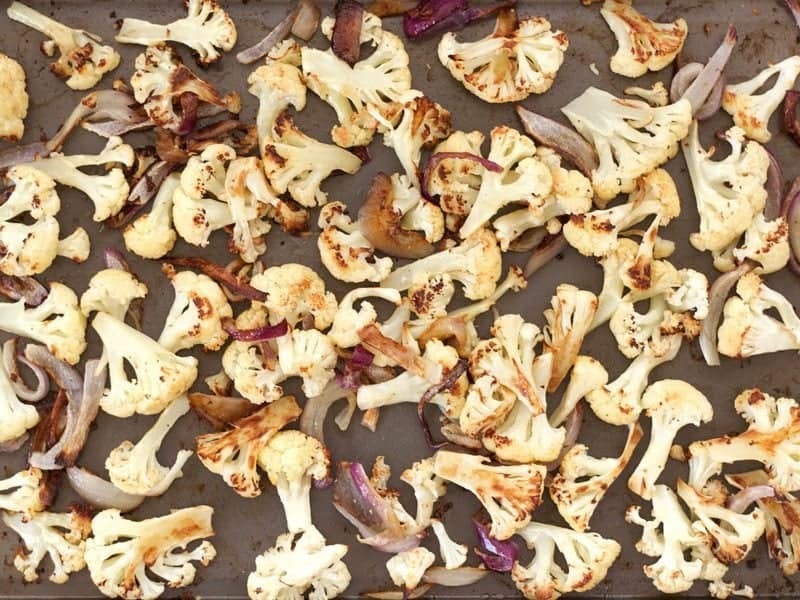 Chop the cauliflower into small florets and place them on a large baking sheet. Slice the red onion into 1/4-inch strips and place them on the baking sheet. Drizzle the cauliflower and onions with olive oil and season with a pinch or two of salt and pepper. Toss the cauliflower and onions until coated in oil, salt, and pepper. Pull the parsley leaves from their stems and roughly chop the leaves into small pieces (about 1.5 cups loosely packed, once chopped). Try this lemon tahini dressing drizzled over all your favorite roasted vegetables! Begin by preheating the oven to 400ºF. Chop one head of cauliflower into florets. Slice 1/2 of a red onion into 1/4-inch strips. 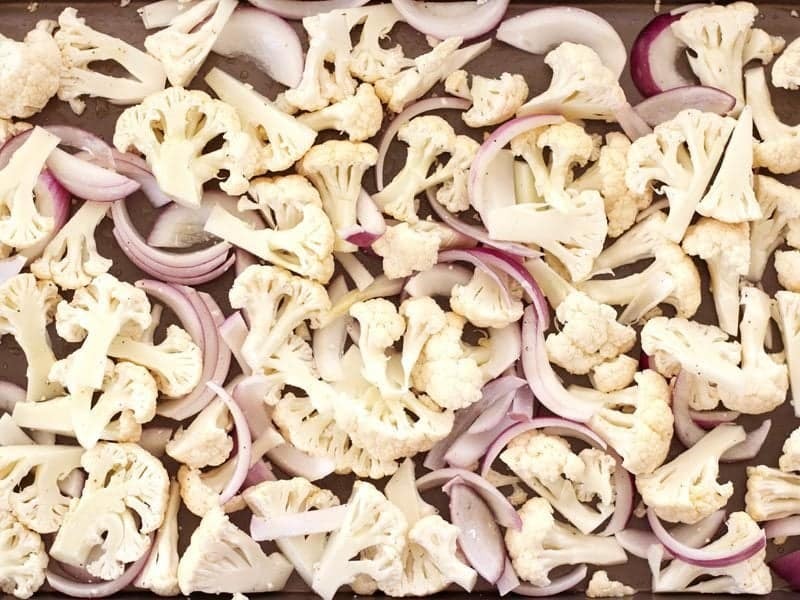 Place the cauliflower and onions on a large baking sheet. Drizzle the vegetables with 2 Tbsp olive oil and a couple pinches of salt and pepper. Toss the vegetables until they are well coated in oil, salt, and pepper. Roast the cauliflower and onion for 20 minutes, stir, then return them to the oven and roast for another 10-15 minutes, or until the cauliflower is tender and the edges browned. (the sides touching the baking sheet brown fastest, so you’ll see more browning once you give it a final stir). While the vegetables are roasting, prepare the lemon tahini dressing. Place 1/3 cup tahini, 1/3 cup water, 1/4 cup lemon juice, 2 cloves minced garlic, 1/2 tsp cumin, 1/4 tsp cayenne, and 1/4 tsp salt in a blender. Blend until the dressing is smooth. Refrigerate the dressing until you’re ready to serve the salad. Stir to combine, and enjoy! You can enjoy this Roasted Cauliflower Salad slightly warm from the oven, or chilled after storing in the refrigerator. This recipe is fabulous! I did half parsley and half mint for the greens and it was great. Added some honey to the dressing. Next time I would add golden raisins to balance the spice with some sweetness! I can’t get over how good this recipe is!! 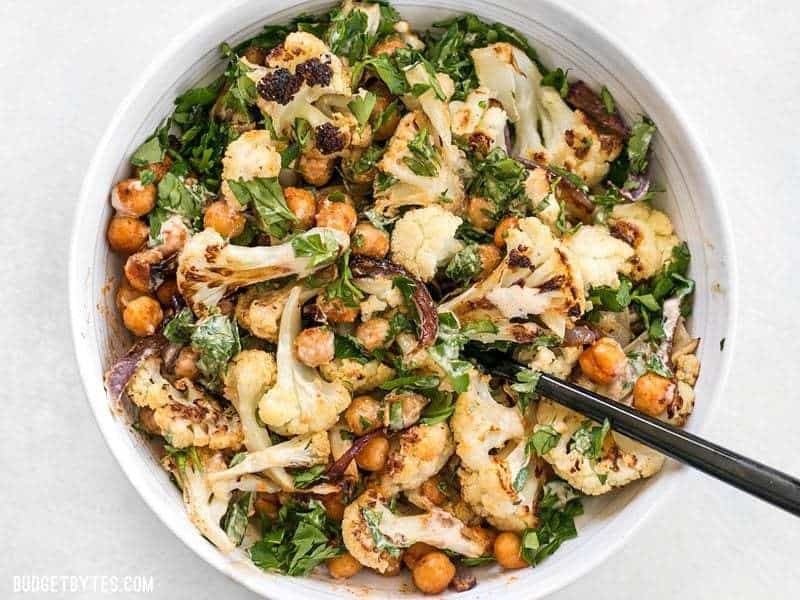 Did not expect that much flavor from some cauliflower and chickpeas, but that dressing…so delicious! It was super filling too. I will definitely be making this again! D E L I C I O U S !!! Will definitely be making this again. 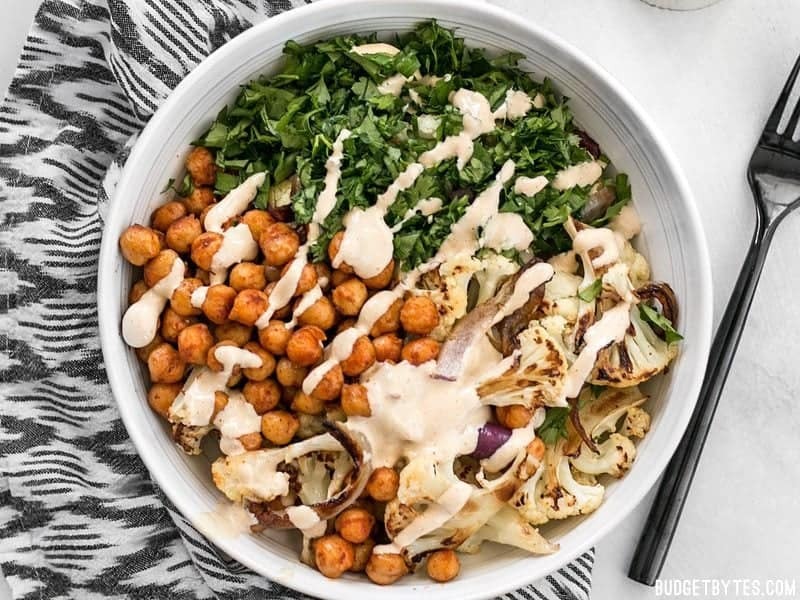 The tahini dressing just brings it all together. This sounds absolutely delicious but unless I am missing something, I cannot find out how many calories it contains unless I actually weigh and add everything up myself. Anyone know? This salad is simply, easy, filling, and best of all DELICIOUS! Thanks for sharing. I just made this for the first time but it will definitely be a week night staple from now on! Love this salad! Thank you!! Delicious salad which I will continue making even when the weather does warm up! I have to say how very Israeli this salad is! We love and use all of these things here, and Israelis are sort of obsessed with parsley (petrozelia); it’s everywhere! And it’s funny that someone even suggested sprinkling pomegranate-arguably the most Israeli fruit ever- on top. Looking forward to making it. Oh awesome!! Sounds like I need to learn more about Israeli food. I think I would like it a lot! OMG I AM OBSESSED!!! So so tasty! I did parsley/baby spinach combo for the greens. I’m honestly not a huge fan of cauliflower but I I could eat this all day long. This was YUMMMMMMMM! I’d saved the recipe a while back and finally tried it last night and I think I’ll be making this regularly till the cold weather subsides! The flavor combination is *fantastic*. 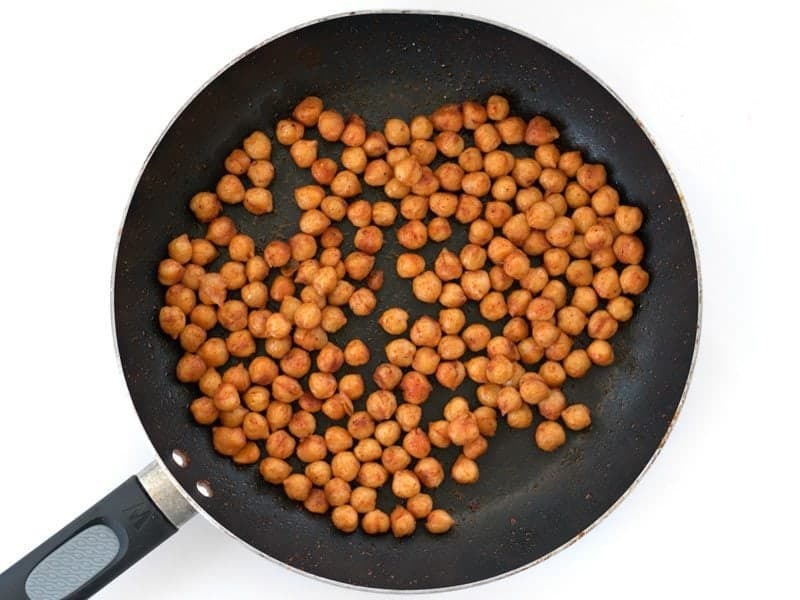 That hit of smoke from the chickpeas is a delight. I’m not sure I’d bother trying a different green… I found the parsley the perfect fit both for its flavor as well as its sturdiness (holds up for leftovers). Ate it again for lunch today, cold right out of the fridge, and it’s even delicious like that. One thing I might try next time to contrast the delicious unctuousness of this dish (and for the pop of color), is to sprinkle pomegranate seeds on top to finish. This recipe is a winner! Thank you Beth!